The VIMS Molluscan Ecology Program has been involved in efforts to restore native Virginia oyster (Crassostrea virginica) oyster populations since the early 1990s. Virginia's oyster restoration efforts to date have relied on a two component strategy: 1) construction of broodstock sanctuary reefs where oyster reefs previously thrived and 2) establishment and cultivation of satellite shell plants around the constructed reef. 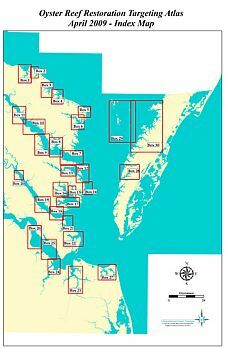 Beginning in 1993 and continuing through the present, this strategy has resulted in the construction of over 40 three dimensional reef structures in Virginia tributaries. Regular shell planting activities by the Virginia Marine Resources Commission Conservation and Replenishment Department provide and maintain the associated shell plants.